This essential “check list” is for anyone who wants to get the very best costume, combined with fantastic value for money and total piece of mind. A great costume doesn’t only need to look good, it needs to be practical, durable, appealing and a great representation of the design and graphics of your character. It also needs to be comfortable to wear and easy to clean. Above all, it needs to be carefully designed to perform and do the job it needs to do, in the chosen environment. To help clarify your needs and identify the “must haves”, this guide will walk you through all the options, possibilities and features that will make your brand ambassador an outstanding and unrivalled success. Buying “off the shelf” low cost suits may not deliver a costume that is fit for purpose. It may well not be hygienic, safe, comfortable to wear, or made well enough to last. expectations, or is even barely fit for purpose. You can double the frustration when it’s an imported item, with no helpline or customer service to help rectify the problem. To avoid the hassles, extra cost and time consuming grief that investing in the wrong product or company causes, follow this simple step-by-step guide. It will help you to ensure your purchase is a delight, exceeds expectations and puts a smile on your face. The more you know what you want your costume to do for you, the easier it is to select the right style. • What type of costume/character do you want? Animal? Human? Object? famous character to link your brand to? • What do you need the costume to do? Give out leaflets? Dance? Perform on stage? Pose for photos? character breakfast? • What type of venue or business is the costume for? • What merchandise opportunities are there for the character? soft toys, t-shirts etc? • What budget do you have in mind for the costume? • What facilities do you have to store, clean and maintain the suit? • Where will the costume be used? Inside? Outside? In a Play Area? At a Theme Park or on a Cruise ship? • Where will the risk assessments be written for? Will provisions be made for costume risk assessments to be undertaken in advance for all venues and public appearances? • Where are you located? UK and Europe? UAE? Australasia? (Different climates need different structures and cooling requirements). • Where will it be stored? This can determine the size of the character. • Where will it be based? (Does it need to be transported from one venue to another?). • When do you need the costume for? • When do you plan to use it? • If you have a specific design in mind – Why do you need this type of character? • Why will this work for your brand, venue or campaign? • How many costumes do you need? Franchise? Chain? Promotion? • How often will they be used? Daily? Hourly? Weekly? One off Event? • How long would you expect the wearer to wear the suit? • How frequently will the wearer be expected to wear it? cleaning between performances for different wearers? • Who is the character designed to appeal to? What is the age group? If there is more than one age group, would 2 different characters’ work better? (E.g. Tom and Jerry, Mickey and Minnie, Lollo and Bernie). • Who will be looking after the costume? While it is being worn, as a minder and between wears? • Who will be employed as a minder for different venues? • Who will train the wearer in personality gestures? Once these points have been determined, it is much easier to design the most appropriate costume to suit your needs. If you already have an idea or actual design, we can assess the design and possibly suggest how to adapt it to make it more fit for purpose. Designing a costumed character that fulfils the requirements and needs of your business or client can sometimes feel like a daunting task. With so many options and character styles to choose from, it can be hard to focus on what matters and you run the risk of producing a character that is impractical, hard to wear and does not deliver the message it was intended to. No need to panic though as here is a list of things that need to be considered when designing costumes. As your character design will essentially become a 3D object, many of these notes contradict the laws of two-dimensional illustrations. One of the main things that a costume should be is wearable, i.e. someone must be able to see, breathe and walk in the costume and it needs to be washable. The easier a suit is to wear, the better it can be ‘brought to life’ and animated. Often an illustration that looks wonderful on paper, doesn’t translate well into a costume due to scale, proportion and detailed finishing. Costume designs can put a lot of restriction on the illustrator. However, there is no point in showing a customer a design which then must be totally redrawn to allow a person to fit inside it. • A human being must fit inside, so always sketch the shape over a human template (different height ranges can be specified). • The further away from a human shape the design is, the more complex the padding and construction methods. This can increase the cost of your character. • The shoulder line is important; head to body ratios need to be aware of the shoulder line, otherwise arms will be very restricted and will appear in a strange place on the costume. • Oversized heads make the rest of the body out of proportion, and can be heavy and difficult to wear. • Leg length is important. To be able to walk, the crotch should not sit below the knees. door is only 2ft 6 inches wide), and globe shapes turn very oval when scaled to fit a 6ft person. • It is possible to airbrush and shade fabric and lycra. • The simpler your design, the less your character will cost to produce. • Features are important. Large eyes help with vision and are appealing to the spectator. to the overall effect of the eye. • Big smiles are very attractive, and often allow for good forward and floor vision. strange on a walkabout costume. • Eyebrows and the angle of them helps to define a face and an expression. • Eyelashes always make a character look feminine. • Block colours are recommended for sketches but since the introduction of Dye Sublimation printing, most colours can be graduated and mixed on certain man- made fabrics. • Fur is available in limited colour shades so please keep this consideration in mind. If your exact colour is not available, we will try to match it to the closest in terms of colour tone. • Contrast on faces can make or break a costume. Extreme contrasts (black and white) will show up in photographs and overpower the character’s features, but this can also be used as an advantage (a panda for example, or heart shaped face definition such as Minnie Mouse). • Plain black or very dark colours on faces get lost in photographs. • Clothes humanise characters and help add personality. They also make a costume more practical to wear and allow for interchangeable outfits (Disney characters for example). • Oversize items such as buttons and pockets add to the appeal. • The scale of the feet is important. Standard size feet ruin the proportion of a costume, and very large feet are impossible to walk in easily or walk upstairs. Take an overall view and ask yourself: “If I had to wear this costume, would I be able to walk/ dance and perform in it?” This should answer most of your questions regarding practicality. Having detailed all the above, creating an illustrated design that will capture the heart of the customer may require some shading and detail adding to the drawing, as well as other finishing techniques that will make it look like a great illustration. The design then needs to be scaled back as a technical sketch, without losing the appeal or essence of the design. Why Choose Costumes with Character? We specialise in listening to you and your requirements, offering practical advice and support. We work with you to ensure you are aware of all the options available so that you can select a costume that is perfect for your requirements. A costume for a safari park will have different requirements from a suit that needs to work in a children’s play area, it isn’t a simple “one size fits all” purchase. We have over 30 years of experience to base our production methods on, working all over the world with all the major Theme parks and production companies, so we are aware of everything that is ‘state of the art’ in our industry and specialised field. We take on board the relevant elements, incorporate these into the design and share them with you. Things such as dye sublimation, vac forming, Antron Fleece, and Techno Spandex; we know what it is and how it can benefit you. Listening and understanding terms such as “lovable” “cuddly” “comical” and “hot” can mean very different things to different people. We make sure we are on the right page, before we start. Here at Costumes with Character, we really do live up to our name. Our costumes are not simply fur suits with a person inside, we bring the design to life. all helps to bring your character to life. If you look at our gallery pages, you can see the classic examples of costumes we have made which have bags of character! So many costume websites have gallery after gallery of photos of costumes, and they are just that; costumes, not characters or brand ambassadors. There is something about the quality, attention to detail, scale and proportion, contrast and silhouette that sets Costumes with Character apart from the rest, which is why so many high- profile brands trust us to bring their Ambassadors to life. Our promotional costumes are perfectly equipped for the job they’re asked to do. Meticulously designed, considerations are made for comfort, safety and practicality throughout the production process. Proportion, texture, colour and contrast are all integral elements that are carefully thought out throughout the initial design process. Head fans can double the wear time and help the wearer stay comfortable in character. For extra comfort and hygiene, we recommend the Coolmax suit worn under a character costume, its high ‘wicking’ properties assist wearer comfort and protect the costume. Keep it smelling as fresh as the day it was made! The methods used when adding branding can affect the total look and promotional impact of a costume. Transfer printing, silk-screen printing, embroidery, sublimation printing, applique or any combination – it really does make a difference. The method of construction and padding of paws ensure that the claws are soft and that the paws are dexterous, tactile and correctly proportioned. After all they are your major point of contact with customers! Footwear is also an important factor in the successful design and creation of any character. Oversized feet must be made safe to wear and tough enough to stand the pace. That’s why we pay so much attention to this aspect of the costume. We employ traditional shoe making methods and use high grade vinyl with the best multi-surface soles to produce a shoe that is safe, comfortable and durable. Unfailing attention to the finishing touches is one reason that makes Costumes with Character a World-Class Costume maker! The pricing structure for costume is relatable to the pricing policy for cars. A Kia and a Mercedes both have four wheels and both will get you from A to B but the quality of design, build, comfort and cost of raw materials can vary enormously, hence the difference in price. Foam – Low cost suits are made from this. It is light, but very absorbent and unpleasant to wear as it will absorb sweat and start to smell unpleasant very quickly. Plastazote – This is an insulation material that costume makers use because it is light, tough and easy to cut. It is used in many day to day products and is an ideal material for large heads and large constructions in general. The only real disadvantage, being an insulation material, is that Plastazote can become hot to wear. This can be counteracted with Coolmax Suits, Head Fans and ventilation holes throughout the structure, keeping the wearer comfortable even during extended performance. Vac Formed Plastic – This is our preferred method and widely used by Costumes with Character due to the fact it is light, non-absorbent, strong enough to rivet a fully adjustable head harness into and, like Plastazote, can be perforated throughout with air vent holes. It is much cooler to wear than the above-mentioned materials and is a popular choice that many of the multiple site holiday companies (such as Butlins, Parkdean Resorts, Haven and Pontins) will order because it is much more hygienic than the cheaper options as it is easier to wash. It is more expensive to make because it requires skilled sculptors to make the initial tooling for the head shapes. However, because we have been sculpting these for over 30 years, we have a huge range of different vacs we can base our characters on and consequently our customers benefit from this ever-expanding library of shapes. White Scrim Foam – Suitable for many applications, but most notably when additional padding is needed, our white foam has a layer of Scrim to make it easier to sew. Some companies less concerned with quality will use this white foam exclusively for their character bodies as it is a lower cost solution. One down side to this foam is that it can be very absorbent and takes some time to dry once wet making it an ill-advised full body solution. Reticulated foam, described below is a much more hygienic and comfortable solution for the wearer. Reticulated Foam – This is the main type of foam we use and is a cooler, more porous material which is then sandwiched between Airtex layers for added stability. This allows air through, and dries very quickly making it a great choice for a comfortable and hard wearing underbody. The difference in cost between these materials is significant so although both bodies may look similar from the outside, the one using the more expensive foam will out-perform the cheaper foam for years, and be far more comfortable to wear. The average lifespan of a Costumes with Character costume used frequently is between 5 and 8 years if refurbished annually, and if care instructions are followed. Some costumes are still coming home for a refurb after 16 years – and still look great! The way a costume is divided into sections and how it is cut will determine how easy it is to put on, how adjustable it is to wear, how easy it is to add additional items and how simple it is to maintain and clean. Costumes with Character have over 30 years of experience of how to construct costumes in the most practical way, and we have tried and tested our patterns and designs hundreds of times. When comparing the cost of one costume to another, be sure to check what it is being made from and the life expectancy of the suit. Sometimes a ‘bargain’ costume which looked good on the website can quickly become a disposable costume after a few wears! Even costumes in a similar price range to our own made by less experienced companies will not have any of the benefits of the materials listed above, that are currently being used by Costumes with Character. What can Costumes with Character do? We can design and make your bespoke Character Costume or Mascot from an individual brief, or turn your own design/logo into a Promotional Character. We can provide custom characters from our stock range and make new outfits for existing characters. Cleaning and refurbishing Character Costumes is another service we offer. What are the benefits of a Character Costume? A character costume or mascot costume is a versatile and effective promotional product. It can create immediate impact and reinforce your brand identity. Character costumes are popular with the press and create public interest in both children and adults alike. They can create a fun, fantasy environment with more longevity than a celebrity endorsee, whilst some even become celebrities themselves! Character costumes are cost effective, strong, versatile, mobile and can be worn by several wearers at many events for years to come. How do I know it will look like my design and fit the wearer? Once we have discussed your requirements we will send out fabric samples for you to choose from. We will also ask what size you would like the suit to be, the height of the person who will be wearing the suit, and possibly their dress size if it is very fitted. We can send you images of how your costume will be made, including progress photos during construction, and final approval photos before it leaves the building. So, if there are any slight changes or alterations to be made to ensure you get exactly what you want, these are made during the production process. Plus, you can also visit our Stockport workroom and see the work in progress for yourself if you prefer. Do you provide training on how to be a mascot character? We can provide a complimentary e-book called ‘How to be a Costume Character’, a guide on how to animate your costume and ‘bring your character to life’. We also provide wear and care instructions and a brief training guide with every Character we send out. How much does a Character Costume cost? Costume manufacture to order will typically cost between £1,300 and £3,000 (+VAT) depending on the design. Prices will reduce for orders of 5+ costumes of the same design. Occasionally we have character costumes in stock and these will typically cost from £1000 to £1,500 (+VAT & delivery). To hire a professional costume character would cost up to £400 per day and therefore owning your own, branded costume for your company is far more cost effective. We do not offer a hire service. What is the timescale to make a costume? Costumes will generally take between 2 and 8 weeks to construct depending on the complexity of the character, the current workload and quantity of costumes in production. Can you deliver my new costume? Yes, we can deliver your costume to the UK and abroad, however a delivery fee will apply. Why are all your costumes over £1,000, when some websites have much cheaper costumes? Several other companies can produce low budget costumes from prices as low as £300. However, not all manufacturers offer a cleaning, refurbishment or replacement part service. This could mean the costumes have not been designed and made with hygiene and durability in mind. If several different people will be using the costume it needs to be washed so that it is clean and hygienic. You wouldn’t expect your staff to wear someone’s else’s dirty uniform, would you? Some character heads are heavily padded, almost like a cushion, which is very hot and impossible to clean. Some are made from insulation foam, which although very cheap and light, is hot and not very durable. Some are made from upholstery foam, which is absorbent to perspiration. Check how the costume heads are constructed and if a clean and refurbishment service is offered before you buy, otherwise your “bargain” costume may be a “disposable” costume after a few outings! Low cost costumes bought from overseas can look good on the websites but they may take weeks to arrive, be poorly constructed and may not be washable. If the costume is not right it can cost more to return than it did to buy it. It is unlikely there will be any after sales service and it may become more of a short-term problem than a long-term investment. Our stock range is built to the same quality and standards as our premium bespoke costumes (Premium and bespoke costumes typically range from £1,400 to £3,000). The stock ranges have been designed to offer a more immediate solution to our customers, but the same methods and materials are used throughout our ranges. Every single one of our Costume characters comes with its very own tour bag. This allows you to keep all your items in one place and gives basic protection from the elements. We provide individually tailored wear and Ccare instructions with every character. This explains how to wash, wear and maintain your costume for years to come! We also offer a refurbishment service; where your character can visit us at our studio for some TLC. Whilst here they get treated to a full head and body wash, along with any brushing, re- spraying, repairs and alterations that need doing. Please call our team on +44(0)161 442 8740 to find out more and book your character in for their very own aftercare appointment today! What if I have a problem with the costume? In the unlikely event you have a problem with wearing any part of a costume made by Costumes With Character, we will be more than happy to listen to you and offer help on how to wear and put your costume on (this can be an issue if you have not worked with a professional mascot before). If that does not solve your problem we will collect and make any necessary alterations and return the costume to you. We have a no quibble guarantee and will offer help and advice for the lifespan of your character. Many suits have been returning for an annual clean and refurbishment for as long as 16 years! Please feel free to make an appointment to visit the studio and try on the costumes for yourself! 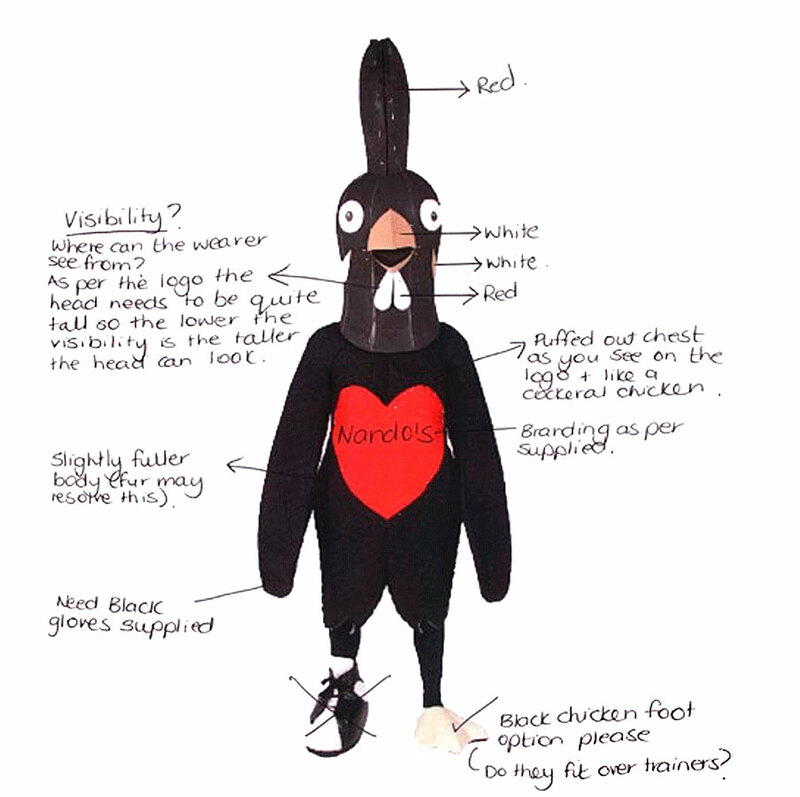 Professional Character Costume- and Mascot-making requires a wide range of specialist skills. There is no “perfect” degree to suit this industry, staff have taken courses in Theatre Design, Entertainment Design Crafts, Illustration, 3D Special Design, Costume Cutting and Production, Model-Making and Stage Management and Props. It isn’t essential to have a degree, experience in a similar working environment in theatre or film, costume or bridal wear is also compatible, as well as enthusiasm and passion. We are expanding each year and always happy to meet new people who are interested in this industry with a passion and talent for making beautiful high quality costumes. along with images of your work. To work in the prop department and produce heads and hands and feet for large 3D character costumes. • To construct character heads and other elements using a variety of materials such as: Plastazote, vac Formed ABS, fur, fleece, glue guns and paint. • To assist with the repair and refurbishment of existing costumes. • To assist with all prop-making tasks required to meet deadlines. The ideal candidate will have 2-3 years of industry based experience and a passion for making character costumes. A degree in a design related area would be of benefit. Candidates should have training and experience in a variety of different prop making mediums. Experience with plastics, Plastazote, pattern-making and cutting are essential. Training and supervisory experience would be of benefit. Experience with handheld air-powered tools, drills, riveters, sanders, dremels and spray guns would be beneficial. The ideal candidate will have an eye for proportion, scale and detail and the ability to accurately create a 3D shape from a 2D drawing. Attention to detail and neat finishes are of utmost importance in this role. Candidates must have very neat glue gun skills, and experience of working with fur fabrics, fleece and Lycra and the ability to make accurate repeats of specific characters. Candidates must write and maintain specification sheets on all jobs and work in a tidy, safe and organized way. You will be required to work on small elements as part of a team, work to deadlines and be prepared to work some overtime when required. The interview will require a short workshop skills test. Training in the production of character heads will be given. To work in the sewing department, assisting in the production and refurbishment of high quality character costumes. • To sew costumes made from a variety of materials such as: Fur, Lycra, Wadding and Jersey. • To assist with all sewing and cutting tasks required to meet deadlines. We often require a sewing room assistant to assist in the production and refurbishment of high quality character costumes. You will have good sewing skills using an industrial sewing machine, excellent attention to detail and organizational skills. You must be able to work to deadlines and targets. You will be working in a friendly busy environment, and must be able to work within a team and individually. The interview will require a short skills test. If you have a design and simply want a quick quote, use this form. The information you provide in this form will be used to contact you in relation to your enquiry and to conduct business with you. The information will not be passed to anyone else. For our GDPR policy follow this link. If you are new to the wonderful world of character costumes and want more information, call us on 0161 442 8740 to talk through your ideas and requirements. If you know what you want but do not have a design we can design it for you. We’ll start by discussing the type and style of suit you are looking for, which may be based on your logo or product or a specific event. We can provide you with gallery pages of several different characters, which may be in the same style and discuss the elements that appeal to you. We can also discuss the budget you are working to since this will influence the design and complexity of the suit. Once this has been approved, we can then provide you with a sketch to review and possibly tweak. We can then provide you with a final full-colour image. Once the design is approved we can produce turn-around illustrations on request to show back, front and sides; discuss branding, colours, accessories and possible extra outfits. Now we know exactly what we are making for you we can provide you with a final quote and timescale. We will then need to know the size of the wearer and any special technical requirements. Once we have received the signed order, we can send fabric samples and images. If it is a complex design we may provide sketches of both how someone will fit inside and possibly technical sketches of how the costume will be made to be the most practical for you. (Just because it looks like a full fur suit wearing a sports outfit, it doesn’t mean that that is the best way to make it!).. We can send work-in-progress photos and mock-ups of scale and features, but depending on how long it takes to approve this can make the process take far longer than usual. We always send a final photo of the costume before we dispatch it. If you are a new customer we will require payment before we send the costume to you. Once you are an established customer we can offer customer credit terms. You get to see the costume before you pay for it, so if any minor changes are required this can be done before it leaves us. We offer a no quibble guarantee on all bespoke costumes. We want you to be delighted with your character, and we offer cleaning, repairs, rebranding, extra outfits and after sales service second to none. Many of our characters are still returning for their Spa treatment even 16 years after they were first made. Costumes with Character specialise in, and have a proven track record of the supply and maintenance of multiple identical high quality practical costumes for the leisure and tourism industry. We are known throughout the industry for our attention to detail, always delivering products and services exceeding expectation, our total reliability, and speed of response, quality of service, customer friendly ethos and exceptional value for money. This is demonstrated by our very high customer retention rate, even customers who venture elsewhere for lower costs or other offers have returned within a year or so with a better understanding of the value of quality and reliability that Costumes with Character provide.